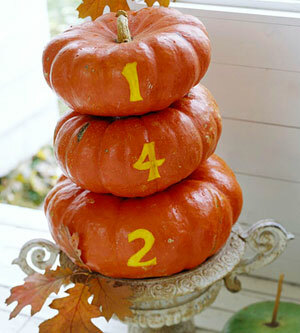 Carve out your house numbers on a stack of pumpkins. Guests will be sure to find the right address. 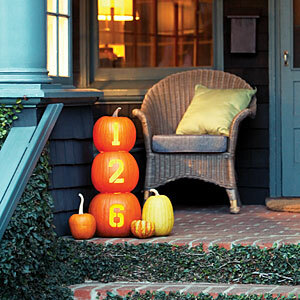 Here is another example of using your house numbers. But this time they are carved all the way through giving off a nice, warm glow. 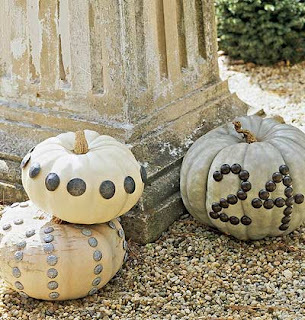 If you're unsure of your own drawing skills, use a stencil or create your own by printing off the numbers on your computer, cutting them out and then tracing their outline onto your pumpkin before you start carving. These amazing pumpkins are so unique and easy to make. All you need are some nail heads! Use them to create a design or display your house number. The last porch idea is one I've featured before on my monograms post. But it's definitely worthy of another mention. 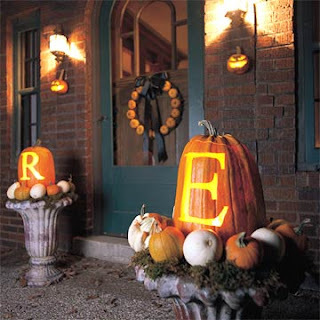 Instead of creating the normal spooky characters on your pumpkins, opt for a more traditional look display your initials. Who doesn't love a good monogram?